What is enterprise architecture and how can it benefit your company? Could a TOGAF certification boost your profits or even help you take the next step in your career? Good e-Learning looks at the benefits of studying the TOGAF enterprise architecture framework for both individuals and businesses. We see terms like ‘enterprise architecture’ thrown around a lot these days, but much of what we read is weighed down by corporate jargon. How can Enterprise Architecture training help businesses in their day-to-day operations, and what makes TOGAF such a well-regarded enterprise architecture tool? 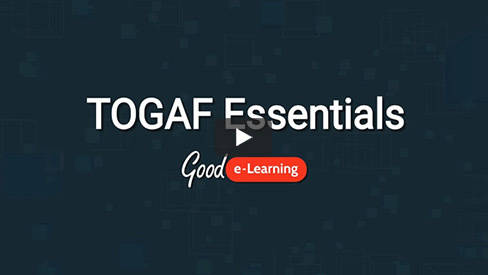 In this video, Good e-Learning looks at the practical brass-tacks benefits of studying TOGAF for individuals, teams and organizations. As one of the world’s leading enterprise architectural frameworks, TOGAF has thousands of certified practitioners, along with a presence in virtually every industry. Good e-Learning offers a range of TOGAF courses, all fully-certified by The Open Group. Our portfolio can suit you regardless of your experience, with courses covering basic TOGAF Awareness, TOGAF 9.2 Foundation, the full TOGAF 9.2 Certification and more. We can even create bespoke elearning courses designed to suit teams or entire organizations based on their unique training goals, structure and KPIs. Are you interested in learning more about how our online training courses can benefit you? Do you want to learn more about TOGAF? Browse our full portfolio of Business & IT courses or visit our FREE downloads area for a wide range of posters, whitepapers, case studies and more from leading industry experts.